It’s the stuff of daydreams: A luxurious yacht that carries you away to remote and pristine coral reefs; an attentive crew; sumptuous meals; spacious accommodations and a rare opportunity to visit places few will ever have the chance to experience and enjoy. At Wakatobi, it’s easy to turn this dream into a reality. All you need do is book a cruise aboard the dive yacht Pelagian. So join us for a glimpse at what awaits when you set sail from Wakatobi on a voyage of discovery and relaxation. The adventure begins at Wakatobi Dive Resort, when a gleaming white motor yacht appears just off the beach. This is Pelagian, a 115′/36 steel-hulled luxury cruiser purpose-built to carry a limited number of guests in comfort and style. In many parts of the world, a liveaboard diving vessel of similar size would be packed with 20 or more passengers. Not aboard Pelagian, which hosts a maximum of 10 guests in five staterooms that seem more like spacious hotel rooms than cramped boat cabins. “I like that guests are limited to just 10 people, as this enables the crew to give more and not have to dilute the service level for any reason. Each guest receives a more focused customer experience overall,” says Simon Bowen. Throughout the yacht, an upscale décor evokes an atmosphere reminiscent of a boutique luxury hotel. The center of social activity is the main salon, which becomes a gathering place for both meals and relaxation, with dedicated dining spaces and an adjacent lounge area where guests can mingle or gather to enjoy the integrated entertainment and media center. The yacht also offers sheltered and open outdoor lounge areas near the bow and on the top deck. These spaces are ideal for reading or quiet time while taking in the sun and sea air, or for enjoying spectacular star gazing in the evenings. The shaded aft deck is used for dive briefings and gatherings, and there is a dedicated, climate-controlled camera room/workshop with ample counter space and charging capacity to support numerous photographers. “The Pelagian is more like a small ship than a dive liveaboard,” says guest Greg Clinton. “It is very well setup with a large salon, media room, and excellent cabins. Mine was the deluxe, which was very spacious and comfortable.” Each of the yacht’s five guest cabins offers substantially more space and luxury than the typical liveaboard. Rather than the compact bunk beds often found on many dive boats, Pelagian’s cabins have side-by-side beds or walk-around queen-sized berths, and all offer full en suite baths with rain showers and separate dressing areas. From the spacious floor plan to the wall art and the smallest décor details, these cabins evoke a feeling of tranquility and restfulness. For those seeking an even more upscale experience, Pelagian’s master suite provides accommodations worthy of a luxury hotel suite. It is one of the largest and most well-appointed accommodation that can be found on a dive liveaboard. This suite spans the full width of the vessel and occupies the entire forward portion of the main deck, providing both privacy and easy access to all parts of the yacht. Amenities include walk-around king size bed, roomy bath and shower, a lounge with a love seat, and an entertainment center fitted with an HD flat-panel TV and Blu-ray DVD player. The Pelagian cruises through the islands of Tomia, Kaledupa, Binongko, Hoga, Wanci and Buton. Rather than following a set itinerary, each cruise is planned based on seasons, weather and most important, guest preferences. This flexibility provides divers with exclusive access to many sites not visited by the resort-based day boats, and encompasses a range of underwater experiences that includes steep walls, drift dives, and caverns, along with some world-class muck diving. Sites such as Sandy Bay provide colorful coral gardens that are also a snorkeler’s delight, while other sites such as Turtle Town and Lobster Wall match shallow reef tops with steep walls that are riddled with overhangs and crevices. Undulating schools of barracuda, snapper and triggers swarm the gorgonian-covered faces of structures such as Fishmarket Pinnacle, while open-water seamounts rise from the depths to attract rays, tuna, trevally and blacktip sharks. At the other end of the spectrum, the shallow, silt-bottom bays of Buton Island are prime hunting grounds for bizarre bottom dwellers, and home to the famous mandarinfish mating displays at Magic Pier. 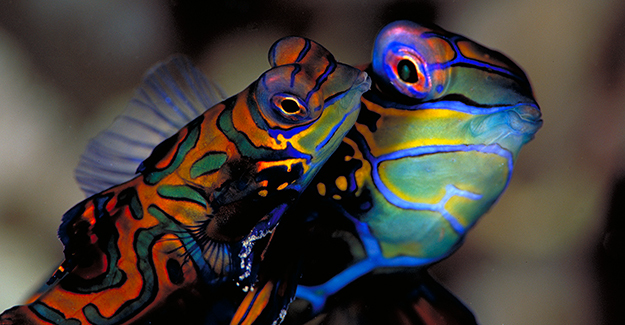 Each evening, just before sunset, brightly-colored male mandarinfish gather at the pier, where they state elaborate courtship displays in hopes of capturing the attention of a female. When a connection is made, the pair move into a head-to-tail position and begin a dance-like upward spiral that culminates in a spawning release. This mating ritual is one of the most fascinating behaviors in the marine world, but it is just one of many intuiting encounters that await in the shallows.